MamaBreak is thankful for the playhouse we were given to review by Boutique Cascades. 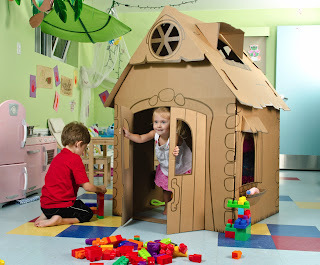 The great cardboard play house is really easy to put up, sturdy and a great size for my 3 year old. Cascades makes products mainly from recycled fibers. We love how innovative and supportive they are of Habitat for Humanity. For each playhouse purchased, they donate $2 to Habitat! These recycled cardboard playhouses are made in Canada from 100% recycled cardboard. This size fits nicely in our basement play room and is big enough to be shared with friends and siblings too! Find them online here or follow them on Twitter or Facebook!